The Animal Rescue League of Berkshire County has just started a program called “Book Buddies” in which kids in 1-8th visit the shelter and read to the cats. Many shelters have similar programs but the one at ASL is a bit more personal. 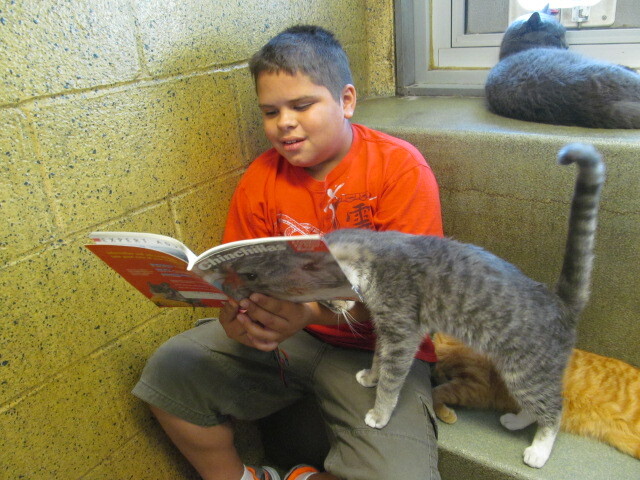 ASL Coordinator Kristi Rodriguez created the “Book Buddies” a after she observed her 10 year old son gain confidence in his reading after practicing with the shelters’ cats. What’s more, the cats enjoy the rhythm of reading out-loud which “soothes and relaxes” them according to ARL’s site.